Çorlu ([ˈtʃoɾɫu]) is a northwestern Turkish city in inland Eastern Thrace that falls under the administration of the Province of Tekirdağ. It is a rapidly developing industrial centre built on flatland located on the highway and off the motorway /E80 between Istanbul and Turkey's border with Greece and Bulgaria. At the 2012 census, the population of the city was 235,354 – a bit more than triple the 1990 figure of 74,681. Bronze Age relics have been found in various areas of Thrace including Çorlu and by 1000 BC the area was a Phrygian-Greek colony named Tzirallum, Tzirallun, or Tzirallon (Τζίραλλον). The area was subsequently controlled by Greeks, Persians, Romans and the Byzantines. During Roman and Byzantine times, the town was referred to as Tzouroulos, or Syrallo. The spelling "Zorolus" is used for the Latinized form of the name of the episcopal see identified with present-day Çorlu in the Catholic Church's list of titular sees. Some writers have identified the Roman town of Caenophrurium (the stronghold of the Caeni and the place where Emperor Aurelian was murdered in 275) with Çorlu, but this seems unlikely as the Antonine Itinerary lists Cenofrurium as two stages and 36 miles closer to Byzantium than Tzirallum, and the Tabula Peutingeriana shows the locations separately. There were important Roman and Byzantine fortifications at Caenophrurium, which was a base for controlling large areas of Thrace. Following a tumultuous early history, Çorlu was brought under Ottoman control by Sultan Murad I, who immediately ordered the destruction of the Roman walls as part of a policy of opening up the town under Pax Ottomana. In the Ottoman period, the town remained an important staging post on the road from Istanbul to Greece. In the early 16th century, the nearby village of Uğraşdere was the battleground where Sultan Beyazid II defeated his son Selim I (August 1511); a year later Beyazid II was defeated by Selim and was the first Ottoman father to be overthrown by his son. Beyazid II died in Çorlu on his way to exile in Dimetoka. Coincidentally, Selim himself died in Çorlu nine years into his reign. Both father and son are buried in Istanbul. In the late 18th century, when the Ottoman Empire began to decline in military as well as economic power, the city found itself at the crossroads of numerous conflicts. Turkish refugees were settled in the city when the Ottomans lost control of Crimea to the Russians. The grandchildren of these refugees met the Russians themselves when Çorlu was briefly occupied by Russian troops in The Russo-Turkish War of 1877-1878. During the Balkan Wars of 1912-1913, Çorlu was the command post of the Ottoman army, but was taken by Bulgarian troops in December 1912. The city was recaptured by Turkish forces during the Second Balkan War in July 1913. Çorlu was then occupied by Greek troops from 1920 to 1922 during the Turkish War of Independence, and was freed after the struggles of the national resistance. The city formally became a part of the Republic of Turkey following the declaration of the Republic in 1923. Çorlu continues to be an important garrison of the Turkish army today as the home of the 189th Infantry Regiment. 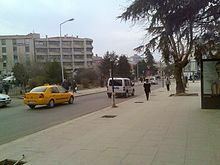 The city today is more populous than the provincial center of Tekirdağ, owing to a population growth initially caused by the exodus of Turks from Bulgaria in 1989 which complemented the traditional left-leaning, industrial working-class of Çorlu, and a second wave of migrants from rural Anatolia in the 1990s who came to work in the factories, who now make up the conservative populace of the city. Another group, albeit smaller in numbers, is the Romani community. The city also had a temporary population of ethnic Albanians and Bosnians flown in during the Kosovo conflict as part of Turkey and Macedonia's efforts to aid the suffering populaces of former Yugoslavia by offering them temporary asylum. The city also has a small Jewish community. In 1970, the only synagogue of the town was converted to mosque, now called "Yeni Camii". The town center bears the hallmarks of a typical migration-accepting Turkish rural town, with traditional structures coexisting with a collection of concrete apartment blocks providing public housing, as well as amenities such as basic shopping and fast-food restaurants, and essential infrastructure but little in the way of culture except for cinemas and large rooms hired out for wedding parties. The roads passing through the city center is often congested, as it cannot bear the capacity of a quarter million populated city. Çorlu's shopping facilities have recently been enhanced by the completion of the 25 km² Orion Mall. While there is little to no nightlife, as Çorlu is close to Istanbul, locals can and often do easily go to "the city" for the weekend. Çorlu today displays the characteristics of typical Turkish boomtowns. The town expanded without proper infrastructure developing alongside. Most important mark of this is the city center, which almost remained the same size since 1993-1994, when the population rise started. There are other landmarks, as well. Such as the city prison, 5th Army Corps, a gas station etc. which were outside of the town before the "boom" whereas today they are inside the city center as odd landmarks. Since around the year 2000, east side of the city has been gradually populated with tower blocks which constituted a satellite area. Alongside Omurtak boulevard of the east side, many facilities emerged (banks, restaurants, malls, police station etc.) here. Thus making it a second center and decreasing the need to travel to the city center. With more than 300 factories, Çorlu is largely a textile producing town, with Levi's and Mavi Jeans being among the companies that have factories here as well as large outlet centers intended to attract consumers from all over Thrace and Istanbul looking for discount clothing. Levi's closed its factory in Çorlu in August 2014. In addition to textiles, Çorlu produces foodstuffs and soft drinks like Coca-Cola, and Unilever products like Algida ice-cream and Calvé condiments. As of 2009, Hewlett-Packard and Foxconn Group have come together for a joint venture in the town to build a large factory and production complex that will enable the two companies to use Çorlu, and Turkey in general, as the hub of their production activities for Eastern Europe and the Middle East.